Who doesn't love fireworks?! As if fireworks themselves aren't fabulous enough, this stunning fireworks display is arranged into a heart shape and made to resemble the Canadian flag. We bet you've never seen a Canada Day card quite like this one! It's fun, it's catchy, and it's sure to make the recipient smile. Nothing says celebration quite like bright colors and fireworks. 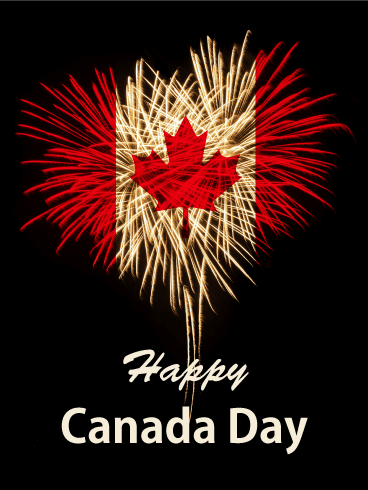 Lucky for you, this Canada Day card has both of them! The animated fireworks add a fun element, and the bursts really help make this birthday card stand out. Throw in the maple leaf and red and white colors, and you have the perfect example of Canada Day celebration. Time to snag this awesome birthday card! 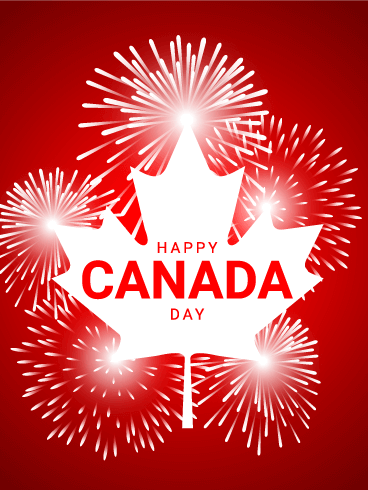 The only thing more awesome than fireworks on Canada Day is maple leaf-shaped fireworks! After all, it's the spirit of this big day! 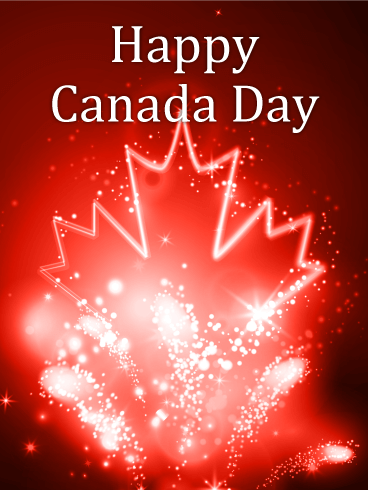 Help someone special in your life get in the celebratory spirit with this awesome Canada Day card. The colors fit perfectly with the holiday, and the bright lights in fireworks really make the birthday card pop. This is a definite win! America, America, God shed his grace on thee! Over 200 years ago, thirteen colonies made the decision to fight against the tyranny that opposed them and create a country that stood for freedom, opportunity, and the ability to fight for what you believe. With this Happy 4th of July card, you can show your excitement for this fun and important holiday to all of your loved ones. Send it today! 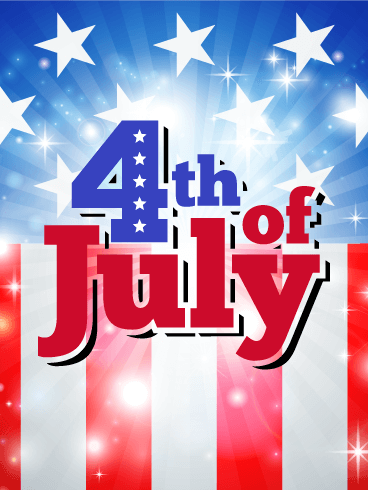 The 4th of July is one the biggest holidays in America. On this day, people come together to shoot off fireworks, grill hot dogs, and raise a cold one to the birthday of our great nation. 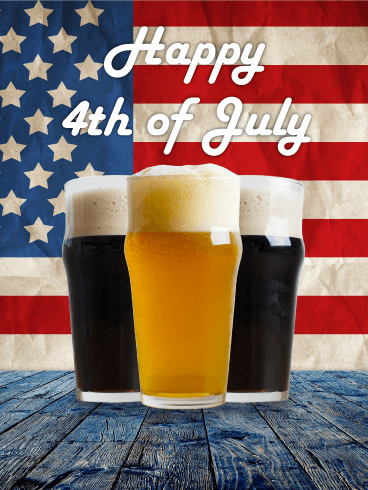 With the foam-filled beers on this Happy 4th of July card, you can raise a toast to the freedoms you have as an American. Nothing says celebration like a cold beer, so send this round to your loved ones today! Nothing says "party" more than balloons, pennants, and confetti! With the red, white, and blue decorations on this Happy 4th of July card, you can start the patriotic celebration for America's birthday. This holiday is meant for fun, friendship, and fireworks to mark the occasion, so use the fun decorations on this card to get your loved ones in the partying mood! Every great holiday is celebrated with fireworks. As these bright and colorful delights fill the air on July 14, remember the struggles and sacrifices that have made this celebration possible. 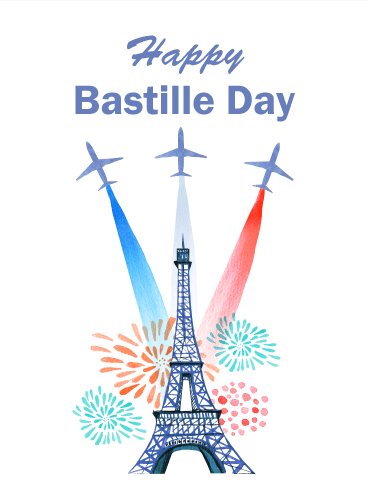 Use the glittering design on this Happy Bastille Day card to show how thankful and proud you are of France's unity and resilience. With the fireworks and cheer on this card, you can make this the best Bastille Day ever! It's time for a celebration! 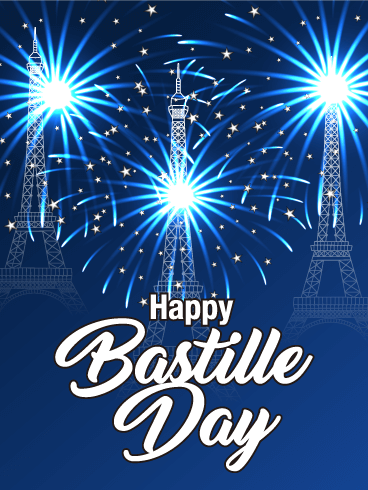 Every holiday offers a great chance to kick back, relax, and enjoy a special, pride filled day with your loved ones, and Bastille Day is no different. With this fun Happy Bastille Day card, you can enjoy all the best parts of this holiday - fireworks, celebration, and patriotism. Every day spent with your loved ones is a good day, so enjoy the party! Flash, crackle, boom! No matter your age or where you live, fireworks always create a sense of excitement and joy. 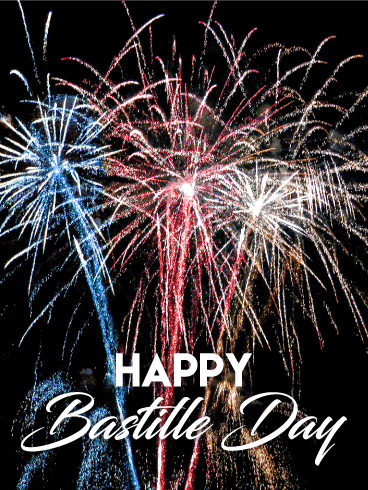 For Bastille Day, use the bright and sparkling fireworks on this Happy Bastille Day card to celebrate with your friends and family. Let the image of fireworks lighting up the sky behind the Eiffel Tower make this holiday even more special and exciting! 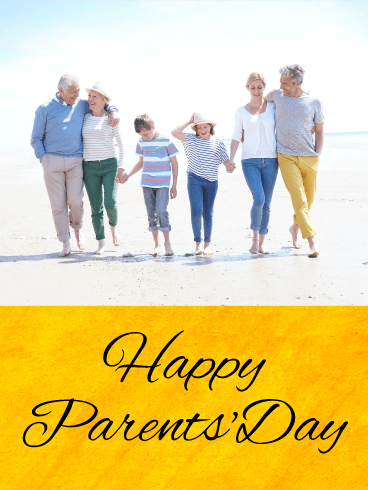 Parents' Day is one day out of the year when we can show our parents how thankful we are for everything they do for us. 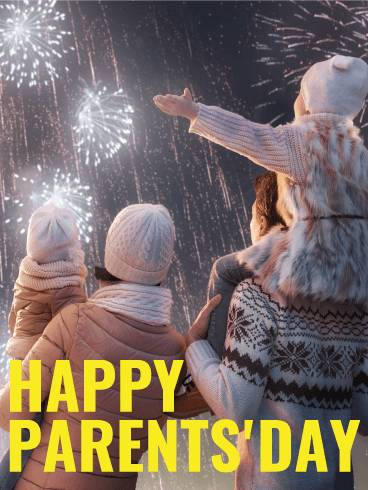 On July 23 this year, use this day to celebrate your parents and thank them for everything they've done for you. Send this Parents' Day card to your mom and dad to make this a day they will never forget! Every generation owes gratitude and happiness to the generation that came before. On Parents' Day this year, thank your parents for everything they've done in your life. This Parents' Day card offers the perfect way to send your love and gratitude to the matriarchs and patriarchs in your family. 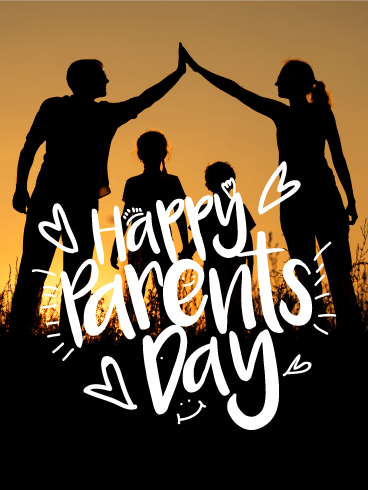 Don't let this special day pass without celebrating your parents the way they deserve! From the moment your parents discovered you were on the way to this very day, they have poured their time, energy, and love into taking care of you and helping you succeed. On July 23, honor these sacrifices by celebrating your parents and everything you love about them. Use this Parents' Day card to show how you cherish the memories you've made together and the love you share. Send it to the best parents in the world today! Dogs may be man's best friend, but they always start as boy's best pal. 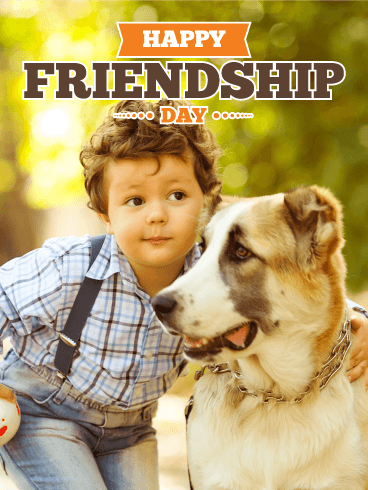 If you have a friend that is always by your side through all the fun, trouble, and excitement you get into over the years, send them this adorable Happy Friendship Day card! The fun picture will show just how happy you are to have their friendship and allow you to share your love for them on this special day! The first Sunday of August is a special day set aside to celebrate the people who mean the most to you. 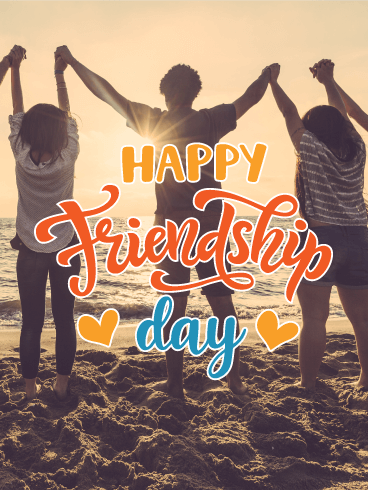 Friendship Day was created as an occasion to celebrate and enjoy the love you share with your friends, and that tradition continues today. With the roses and hearts on this Happy Friendship Day card, you can tell your friends how much they mean to you and how thankful you are for them. When you think of your friendships, what comes to mind? Do you remember all of the good times you have had together and the great memories you have made? The best friendships are founded on the laughter, smiles, excitement, and contentment you experience with the people you love. 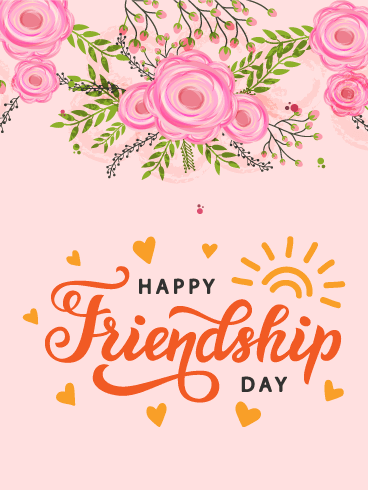 With this Happy Friendship Day card, you can remind your friends of all the best memories you've made together and the friendships that have come from them. Those of us with the good fortune of being blessed with a sister, whether younger, older, or the same age (Twins! 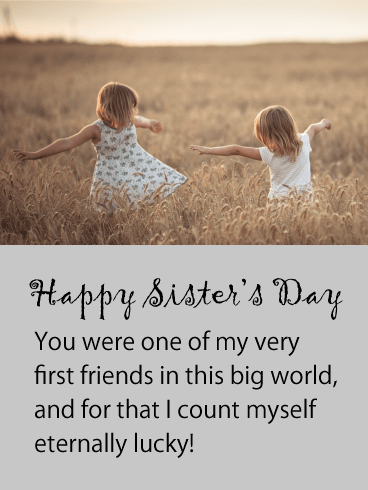 ), know that a sister is our first confidant, best friend, ally, and accomplice. A sister could get you in trouble or take the fall. A sister is the greatest friend of all. 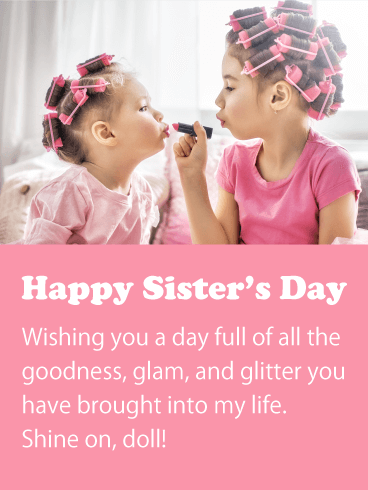 Let your first friend know that you're still grateful for them always being there by sending this whimsical Sister's Day Card. It's said that you can learn more about another human being in an hour of play than you can in days worth of discussion, and nobody has played with you more than your sister. So it stands to reason, the whole world round, that few would know you better. 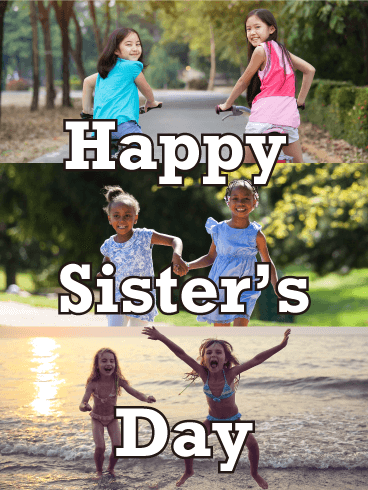 Thank her for all the games you played by choosing to send this Happy Sister's Day card covered in smiling duos out enjoying the world! She helped you try on dozens of costumes, walk in your mom's high heels, and apply your lipstick. She was there as you explored who you wanted to be. She's still there now supporting you through every move you make while navigating your life, and you wouldn't be who you are without her. She always knew how bright you shine. Tell her how much that means to you this Sister's Day by sending her this precious, pink card! How many times have you flown above the clouds? Have you ever stopped to think about the history of aviation? On August 19, celebrate the beginning of flight with this Aviation Day card! Remember the people who have come before you to make your travel possible and the brothers who started it all. 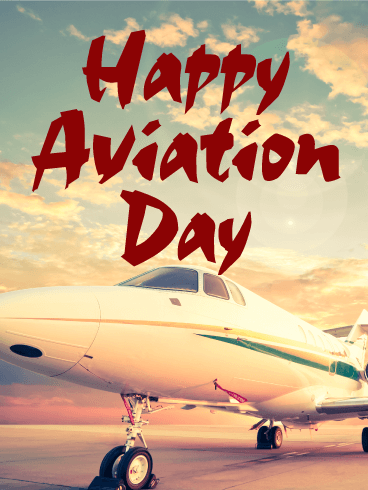 Send this Aviation Day card to celebrate air and space travel today! Throughout the world, millions of people fly from place to place every single day. Though common in today's world, flight was nearly impossible just 100 years ago. To celebrate this incredible achievement, send this Aviation Day card to everyone you know on August 19! Learn about the Wright brothers and their incredible achievements. Make this special date a day to remember just how far we've come. Since 1939, Americans have celebrated aviation and the beginning of flight on Oroville Wright's birthday, August 19. 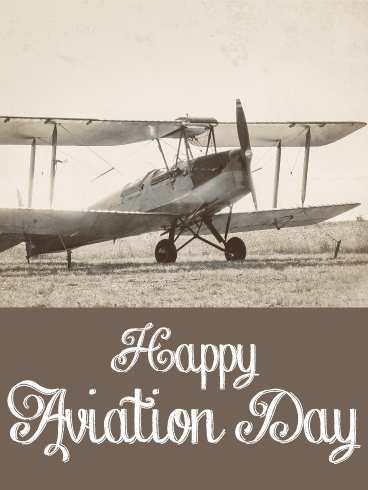 As this date draws near, use this occasion to celebrate the start and evolution of flight with this Aviation Day card! 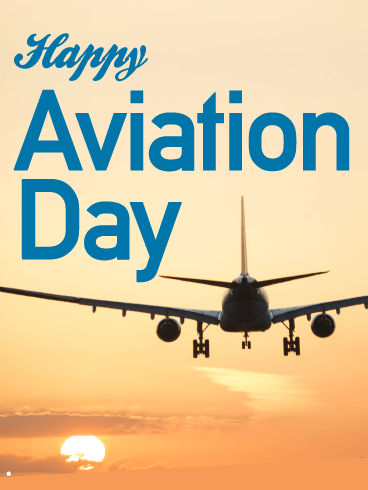 Honor the ingenuity, sacrifices, and hard work that made air and space travel possible for us today by sending this Aviation Day card to your loved ones! 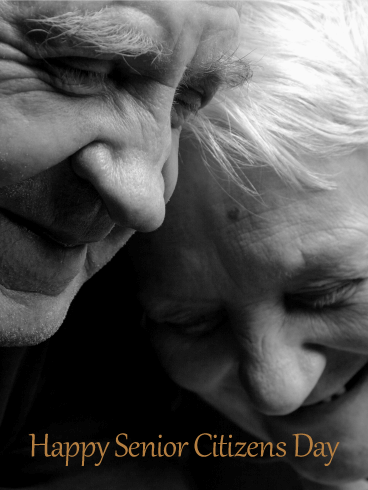 Every year on August 21, Americans celebrate the lives and accomplishments of our senior citizens! 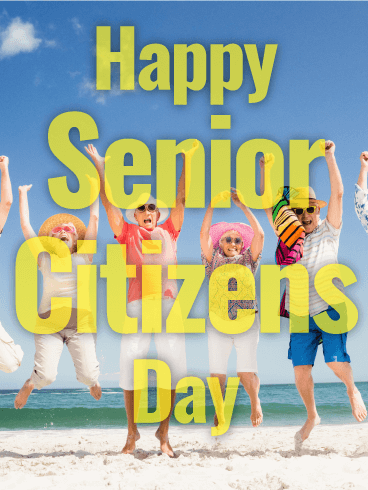 To honor and celebrate the senior citizens in your life, send this sunny Senior Citizens Day card to the elderly folks you know and love. Use this special day to pay your respects to their incredible accomplishments and thank them for their sacrifices and love! The best friends stick together through thick and thin, even into the golden years of old age. 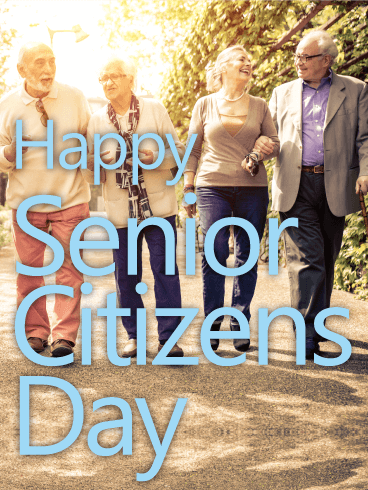 To celebrate the relationships you have, send this Senior Citizens Day card to all of the elderly friends you have! This sweet gesture will show how much you cherish your friendships and how excited you are to celebrate the senior citizens in your life! The longer you live, the more you experience. This Senior Citizens Day, take some time to sit with a senior citizen to hear about their life experiences through their many years of life. Then, use this Senior Citizens Day card to thank them for sharing their time and love with you. Honor their long life and sweet spirit with a special celebration on this important day! 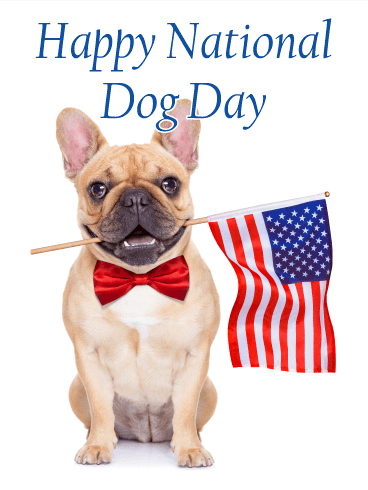 If you've got a friend or family member who loves their dog almost as much as they love their country, we've got you covered with the perfect national dog day card. Just look at that precious pooch, with its adorable smile and bow-tie. 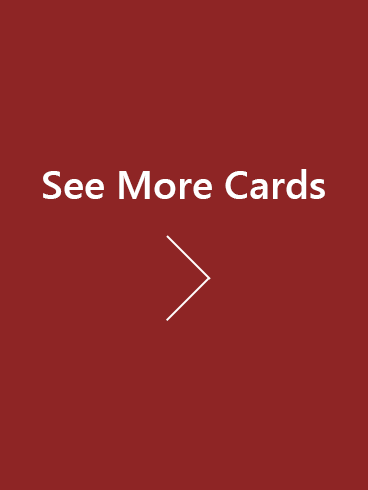 Add in those glistening eyes and the fun American flag, and you've got a card that nothing else can even come close to. Bulldog lovers are a special breed, a group of people with an undeniable bond with their pups. If you know one, you know how awesome this day is for them! 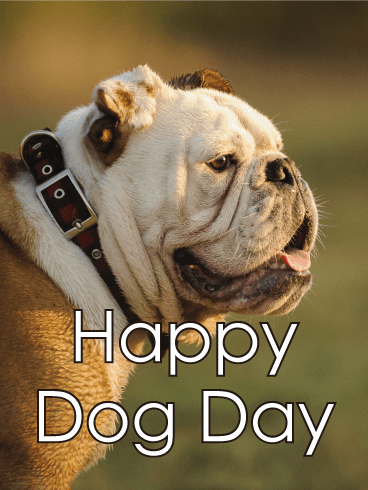 Make the bulldog lover in your life smile with this fabulous dog day card. This smiling bulldog is both gorgeous and precious, and it make the perfect addition to anyone's desk or bulletin board. We dare you to take one look into those sweet puppy eyes without completely melting! It's impossible! 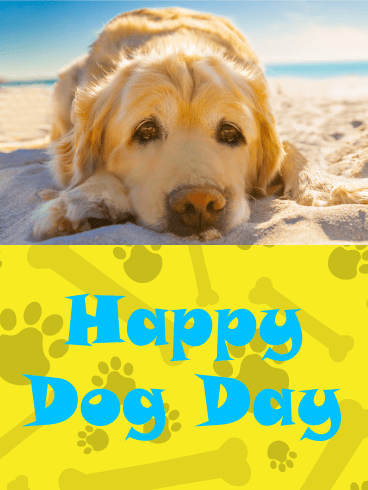 Add in the gorgeous beach backdrop and the soft doggy skin and you have the perfect dog day card. Whether you're looking for a card for a fur-loving colleague or hoping to wish your dog-crazy sister, you can't go wrong with this one. When it's time for a holiday celebration, fireworks are the best way to party! 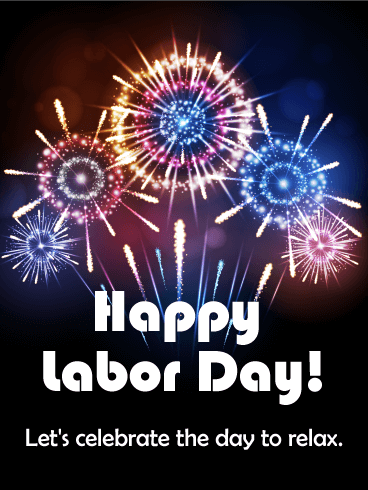 For the past 123 years, the first Monday in September has been set aside as a day of rest to honor the hard work done every other day of the year. To celebrate the holiday, send this Labor Day card to your loved ones! Use it to add fireworks to their Labor Day celebrations this year! Every day and every night of every year, millions of Americans go to work to keep our country running smoothly for everyone else. This is a time-honored tradition that has continued for hundreds of years. To make the most of this hard work, send this Labor Day card to your friends and family. 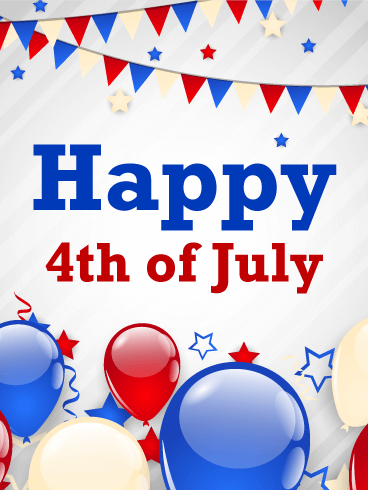 Celebrate your patriotism and this fun-filled holiday by remembering the hard-working Americans of yesterday, today, and tomorrow. 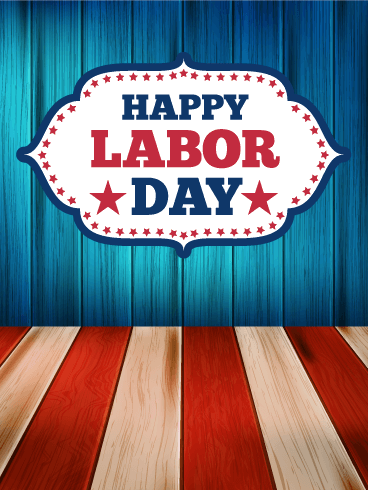 On the first Monday of September, Americans will take the day to celebrate Labor Day. This holiday is a time to remember the people who built our country and to honor the hard work they did to make a dream into a reality. 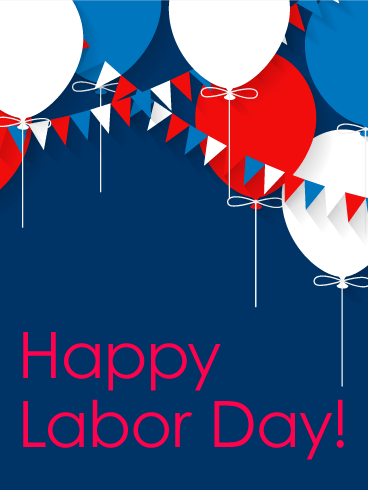 To make this day extra special, send this Labor Day card to your friends and family. Show that you're thinking of them on this day of celebration!